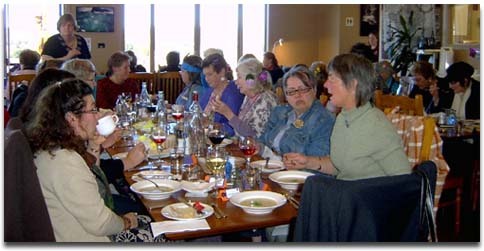 The Lake George Day VIEW Club is a charitable women's organisation that meets on the third Tuesday of the month. After the meeting we have lunch, with a guest speaker or activity. The meeting venue changes regularly, and cost is $15-$25 for lunch, depending on venue. For more information about the Lake George Day VIEW Club, please visit our blog at lgdviewclub.blogspot.com. In 1960, the General Secretary of The Smith Family, George Forbes, created VIEW Clubs of Australia, for women. Back then the purpose of VIEW (Voice, Interests and Education of Women), was to offer companionship and help women, particularly those in rural communities, to overcome social isolation, while improving opportunities for women to have their say, especially at government level. Today VIEW is a national, self-governed women's organisation with 21,000 members in 400 communities. As a valued part of The Smith Family, VIEW members contribute significant fundraising initiatives and volunteering support, to help give disadvantaged children the step up they need through education to achieve their goals as adults. In celebration of VIEW Clubs 50th Anniversary in 2010, and to set VIEW on the path forward for the next 50 years, the logo has been refreshed and updated in response to the new times we live in. The new contemporary design represents the new identity while giving voice to and celebrating connections and friendships with renewed energy. Inspired by the colours used by the women's movement, the purple signifies dignity and self-respect, while the green signifies hope and new life. The “circle of friendship” emblem was chosen because of its encompassing nature and softness. The points and curves represent a circle of women supporting each other and their community in a sharing and giving way.